Behind every great comeback, there is a tale of suffering and frustration. So went Jelena Jankovic’s day, from the time she led Venus Williams 6-1, 4-1, until she walked off the court the improbable loser of the match. The matchup between these two reveals no secrets — Jankovic’s game has always relied on accuracy and her backboard-like ability to keep rallies going, and Venus’ attacking style has been on display for two decades on the WTA tour. After her stellar run to the Australian Open final, Venus has re-emerged as a leading contender in the minds of many who follow the sport. Her path back to prime time has been patchy, but the past few years, in particular, have seen Venus put up a serious challenge to the top players in the game, including both her sister and Petra Kvitova, in memorable matches in the Slams. But, it would be an understatement to say that she was off to a slow start today. It was hard not to think that maybe her run in Australia took out too much from her, especially as one saw the tape on her thigh and arm. And, her shots sprayed all over the court — except for inside the lines. By the time the match was an hour old, it was difficult not to think it would end up as one of those Venus matches — the ones where she hasn’t been able to find her range, and finds herself in the locker room before she can right the ship. Jankovic had her chances — plenty of them. The ones she will likely regret the most were the three match points she lost at 6-5 in the second set on Williams’ serve. What will vex her the most is that more than one of those points were lost on Jankovic errors — a particularly annoying fact for a player whose game is predicated on making fewer errors than her opponents. But, by the time Venus managed to win the second set in a tiebreak, the momentum had fully shifted, and Jankovic and Williams seemingly switched roles, with Venus impressing with her accuracy and drive, and Jankovic hitting more balls into the net or out of bounds. 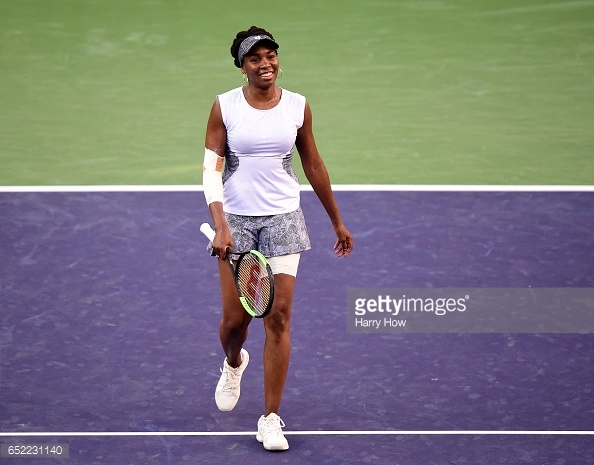 As Venus mounted her comeback, she had the crowd as a partner, cheering her on every step of the way. Given the difficult history between the Indian Wells’ crowd and the Williams sisters, today’s reaction shows how far the sisters’ efforts to move forward have come. As for Venus, when asked how she managed to come back in this match, she laughed and joked “I didn’t see no fat lady singin'” — one suspects that, in Venus’ case, she never will.